A quality service is provided which is good value for money, accurate information about services is available to each customer. Our Staff are trained to the appropriate standards to do their job and all customers are treated in a respectful manner. 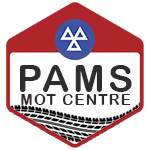 I have a coach built camper van and pam's was the only garage that were able to carry out MOT , Fast clean and helpful. Have returned for more work and will use again. I like my garages to be good, basic places, where the staff are sound, honest and look to giving the motorist a good deal. That's what you get with Pam's Motors. My 14 yr old Honda Civic and my 23yr old camping van have their MOTs at no great cost. My first port of call in MK. Trust this centre for anything.They are family run and so helpful.Have got me out of trouble a few times now. Honest and always friendly and do a good job. Book your MOT online for special prices and discounts. Have your service done by qualified technicians. Contact us or drop in our test center for more information. Not sure what is wrong with your vehicle? Trust or technicians to pin-point the source of your problem. Call us or drop in our test center for hands on advice. How much will my MOT cost? MOT prices start from £30 for a normal car/small van to £40 for class 7/motor homes. How long will my MOT take to complete? An MOT test takes approximately 30 – 45 minutes to complete. If the MOT fails, the MOT report will detail notes on the failure as well as advisory items that are suggested for attention. You will have 10 working days to have the items repaired where there no re-test will be charged. Can I wait while my car is being tested? Yes, we have a ‘While you wait’ service.